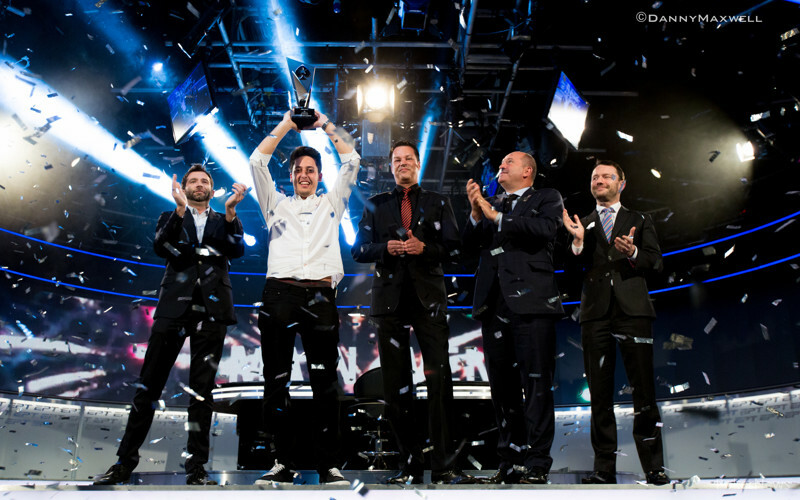 Adrian Mateos Wins the 2015 EPT Grand Final Main Event (€1,082,000)! The European Poker Tour found its first Spanish winner on Friday night, with 20-year-old Adrian Mateos walking away with the largest score of his poker career and second major poker title. It may have taken until the very end of Season 11 for a Spaniard to win, but Mateos did it, and he now holds two legs of poker's Triple Crown. The final day of the 2015 PokerStars and Monte-Carlo® Casino EPT Grand Final Main event started with just six players remaining — and what a tough final six it was. Ole Schemion, one of the best players in the world and EPT Season 10 Player of the Year, was perhaps the most recognizable name, but there were certainly others in contention. Team PokerStars Pro Johnny Lodden was still in, back for more after finishing third in this event two years ago. Mateos, the 2013 WSOP Europe champ and current number two on the Spanish all-time money list, was present. Then, Jose Carlos Garcia, the Polish regular with a lot of experience, also joined. But, leading this bunch of seasoned players were two players not playing the game professionally at all — Hady El Asmar from Lebanon and Muhyedine Fares from Senegal were first and second in chips when play got underway. The day started with Garcia as the short stack, but he wouldn't be the first to go. It was fan favorite Schemion hitting the rail in sixth. Schemion paid off Fares in a huge hand where the German hit two pair on the turn, only to see his opponent hit the nut flush on the river. Not much later, he lost the remainder of his chips with ace-three against Adrian Mateos' ace-king. Schemion took home €233,500 for his sixth-place finish. Short stack Garcia exited in fifth place when he moved in with a suited ace-nine. Again, Fares was the one benefitting, as the man from Senegal had kings and saw his hand hold up. 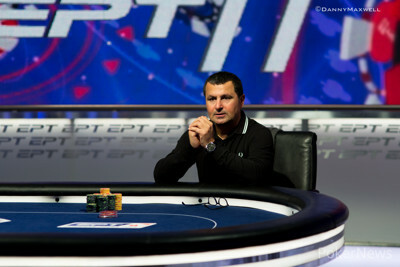 Garcia took home €297,250 for his fifth-place finish. The first two players made their way to the pay out desk rather quickly, but four-handed play would take a bit longer. All four had pretty deep stacks, and it would take a big hand to change that for one of them. It was a hand to remember, for both involved, but maybe more so of a nightmare memory for Lodden..
Lodden made it 160,000 to go with the , and Mateos called on the button with the . Fares was in the small blind and called with the , and then El Asmar had the in the big blind and called. The flop came , and action was checked around to Mateos. The Spaniard bet 275,000, and Fares called with second pair. El Asmar folded before Lodden check-raised to 715,000. Mateos, with nothing but some back doors, called in position. Fares folded the best hand. With 2.385 million in the pot, the fell on the turn. Lodden, with 2.7 million behind, checked, and Mateos bet 650,000. Lodden made the call. The fell on the river and Lodden checked with 3.685 million in the pot. Mateos moved all in after some heavy tanking, but Lodden tanked even longer. After about four minutes, he double checked his cards and said, "Still the same cards," with a smile. Eventually, Lodden decided against it, and he folded the best hand. Mateos showed the bluff and Lodden couldn't hide his frustration, though he did it with class. Despite all his experience, Lodden was surely tilted by this hand, and he couldn't get anything going after. Finally, he exited in fourth place for €379,000 when his ace-queen was out drawn by El Asmar's ace-nine. The first community card in the window was the , and no queen would appear behind it. El Asmar was the one who knocked out Lodden, but he was still the short stack behind Mateos and Fares. There was no need to splash chips around, though, as there was enough play left for all three of them. Somehow it didn't take long for El Asmar to exit, and he finished in third place for €486,000. Fares started the heads up with more than a 2-1 lead — 11.2 million to Mateos' 5.5 million. The two swung back and forth a little bit, being even at one point, only for Mateos to drop back down again. Mateos eventually closed the gap by hitting bigger hands and winning more pots without showdown. Mateos only had 2 million less than Fares when the biggest hand of the tournament was played. Fares opened with the , and Mateos called with the . 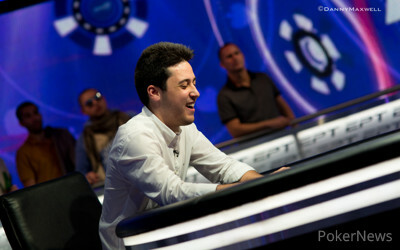 With 660,000 in the pot and both hit something on the flop, Mateos check-raised the 425,000 bet from Fares to 1,100,000. Fares wasn't backing down and three-bet to 2.675 million. Mateos shoved all in for 7.045 million, and Fares made the call without much hesitation. A 14.75 million-chip pot was the result. A on the turn and on the river saw Mateos land as the new chip leader and Fares was down to less than 20 big blinds. Four hands later, it was all over. Mateos and Fares got their chips in the middle before the flop with the for Mateos and the for Fares. Mateos flopped an eight and had his opponent drawing dead by the time the turn landed. 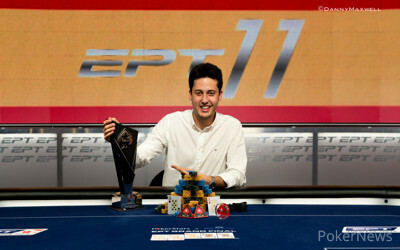 With that, Mateos became the first-ever Spanish European Poker Tour champion. After 11 seasons and 105 EPT events, the 106th title finally will go into the books as won by a Spaniard. Mateos is still the number two on the Spanish all-time money list, with Carlos Mortensen and his almost $12 million in winnings far away, but he has widened the gap over 2014 November Niner Andoni Larrabe considerably. 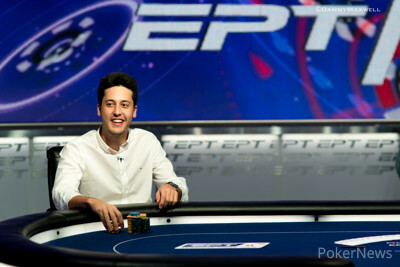 Mateos won an Estrellas Main Event at the ripe old age of 18, the WSOP Europe Main Event at 19, now the EPT Grand Final Main Event at age 20. He'll turn 21 just before the WSOP Main Event in Las Vegas, so he'll be able to play. One thing we can say without a doubt is that we should hear a lot more from this Spanish sensation! That concludes the 11th season of the European Poker Tour. The tour makes its return in August in Barcelona, as it will once again be the opening stop for the tour's new season. For now, thanks for following along and see you at the next stop! Hand #223: Muhyedine Fares opened to 410,000 Adrian Mateos re-raised all-in with and Fares made the call. Fares was dominated and at risk, and the flop was a good one for the Spanish player. The on the turn meant that his opponent was drawing dead. He shook hands with his opponent before jumping into his delirious rail. The inconsequential was the river card, and Muhyedine Fares was eliminated in 2nd place for €679,000. Boutros Naim first crossed our path in Deauville. We didn’t know it at the time but he was the man on the stairs outside the tournament room, almost speechless over a series of bad beats. But there was more to Naim that meets the eye, as the PokerStars Blog now reports. Hand #220: "How much do you have?" asked Adrian Mateos before the 220th hand of this final table was dealt. Mateos raised to 250,000 with and Fares called with . Both players checked a board of down and Mateos won the pot. Hand #221: Muhyedine Fares raised to 360,000 and Mateos folded. Hand #222: Mateos opened to 250,000 with and Fares three-bet all-in with and Mateos folded. Hand #219: Mateos opened with the ace-seven and got three-bet by Fares with the ace-ten. Mateos folded. Hand #220: Fares opened with and Mateos called with the . 660,000 in the pot and both hit something on . Mateos checked and Fares bet 425,000. Mateos, having flopped two pair, check-raised to 1,100,000. Fares, with the top-pair and back door flush draw, three-bet 2,675,000. Mateos shoved all in for 7,045,000. Fares made the call without much hesitation. A 14,750,000 pot was the result. Mateos was well in front with his two pair (72% equity), up against Fares one pair (28% equity). This could be the last hand of the tournament, but it was a long shot. The on the turn gave Fares some new outs. The on the river was a blank though, and Mateos doubled! Fares dropped down to under 20 big blinds. The two players are going on a twenty minute break. When we return, blinds will be up to 60,000/120,000 with a 20,000 ante. Stay tuned! Hand #212: Fares raised from the button with and Mateos called with . The board was and Mateos check-folded to Fares' bet. Hand #214: Fares called from the buton with and Mateos raised to 300,000 with pocket queens. Hand #215: Adrian Mateos min-raised from the button with and Fares called with . The flop was and Fares check-called Mateos' bet of 175,000. The turn was the and this time it went check check. The river was the and Fares check-folded to a bet of 450,000 from Mateos. Hand #216: Fares had on the button and raised to 200,000, and Mateos called with . The flop was dealt and action went check check. The turn was another ace, this time the , and Mateos bet out for 300,000. Fares folded and shipped more chips to Mateos. Hand #217: Mateos raised to 200,000 with from the button, and Fares just called with in the big blind. The flop was dealt , Fares checked, and Mateos bet 175,000. Fares folded. Hand #218: This time Fares just called with and Mateos checked with . Mateos bet out 200,000 and that took down the pot as the players went on a 20 minute break. Hand #206: Fares (button) opened and Mateos (big blind) three-bet. Fares called and a flop of appeared. Mateos had and bet 475,000. Fares folded his . Hand #207: Mateos made it 200,000 with and Fares called with . The flop came and Fares checked. Mateos bet 225,000 and Fares called. The hit the turn and Fares and Mateos checked. The hit the river and Fares bet 425,000 into the 870,000 pot. Mateos folded instantly. Hand #208: Fares found on the button and made it 225,00. Mateos called with . The flop came and Mateos checked. Fares bet 250,000 and Mateos check-raised to 675,000. Fares three-bet to 1,350,000. Mateos folded. Hand #209: Mateos min raised with and Fares folded. Hand #210: Fares with the raised his button to 250,000, Mateos called with the . The flop came , missing Mateos. The Spaniard check-folded to Fares' 250,000 bet. Hand #211: Mateos made it 200,000 with . Fares woke up with and three-bet to 600,000. Mateos called. 1,220,000 in the pot and a flop of to work with. Fares checked his gutshot, Mateos bet 800,000 with his flopped two pair. Fares called. With now 2.8 million in the pot and a as the fourth community card, Fares checked again. Mateos bet 1,400,000 and Fares folded after some heavy tanking.